I love cole slaw but hate mayonaisse, so I am always making vinegar based slaw. 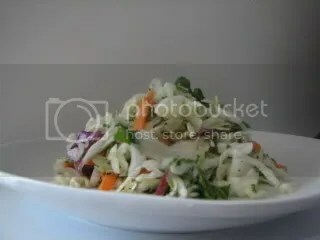 I came across this recipe and had to try this new slaw variation! It didn’t call for vinegar but after reading the reviews, I did decide to add a couple splashes of it anyway. I used balsalmic vinegar. I love cilantro so this was a perfect, healthy dish for me to make. Very refreshing! Place coleslaw mix and cilantro in large bowl. Whisk canola oil, lime juice, salt, and pepper in medium bowl to blend. Add to cabbage mixture; toss to coat. What a great recipe and pic too! Thanks for sharing – this sounds like a perfect summer slaw for a picnic! So simple and light, it looks delicious! I’ve been eating healthy for the past couple of weeks (well trying to anyway) and this would make a great lunch! this looks perfect for summer! i’ll probably cut back on the oil and increase the lime, i love lime!